California is the sun-kissed state of the United States, featuring soaring heat and plenty of sunshine, making it a popular tourist destination and the most populated state in the entire country. Fishing in California will offer opportunities throughout the state, with year round fishing possible in a number of locations, particularly along the coast. This can be credited to the presence of the Pacific Ocean, which has helped to create endless fishing locations – although there is much more on offer than just this. Various lakes and rivers provide a diverse selection of fishing spots, including both salt and freshwater locations that are teeming with species. 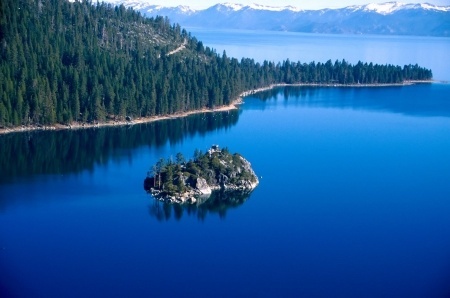 Situated high in the Sierra Nevada between California and Nevada, Lake Tahoe has long been one of the most popular tourist destinations in the US with its panoramic mountain views, ski resorts and various outdoor recreational offerings. As the largest alpine lake in North America and sixth largest in the US, Lake Tahoe is also a recreational fishing paradise. With Lake Trout (Mackinaw) season open year round and a lake record of 37 lbs, no wonder this is one of California’s top freshwater lakes. Other popular catches here include Rainbow Trout, Brown Trout and Kokanee Salmon. There are many freshwater lakes in California, all of which have a reputation for being great spots to catch some bass. Clear Lake happens to be the largest natural lake (with boundaries completely within California) in the state, which ensures there will be a lot game to catch – it is regularly regarded as one of the best Largemouth Bass fishing locations in the entire country! Expect to find some rather sizeable bass here (upwards of 15 lbs!) and while some spots are known to be better than others, you can almost expect to find at least one bass biting down on the line. Catfish is a another species known to be found here, and there is some great trout fishing holes worth checking out at Blue Lakes, which can be found nearby. Other Great California freshwater locations include Lake Almanor, Lake Berryessa, Lake Shasta, Big Bear Lake (for Trout and Salmon), the Sacramento River (For Chinook and Pink Salmon) and Rush Creek. Southern California has so many different amazing fishing locations that it will be difficult to select just one to visit! The fantastic weather found in California also makes all-year fishing here very possible, although what time of the year will dictate which particular species can be caught. You can easily charter a boat for some ocean fishing in any number of spots throughout Southern California, with cities from LA to San Diego all packed with great fishing spots. There is near enough an endless amount of beach and pier fishing locations can also be found in this stretch of land, and are certainly some of the best spots in the state. Long Beach for example, has a reputation for providing amazing deep sea fishing opportunities, featuring more than 30 species of some of the most sought game fish out there. Giant yellowtail, tuna, whitefish, red snapper and much more can be caught around these waters, and in sizes that exceed 40 pounds! Spots worth checking out within Long Beach include Catalina Island and Huntington Flats, but chartering a boat along any stretch of coast along Southern California will likely yield many great locations of their own too – there is seriously that many to choose from! While you could mention dozens of pier fishing locations up and down the coastline of Southern California, Imperial Beach is certainly home to some of the best. The Imperial Beach Pier happens to be the southernmost pier in the entire state and is 1,500 feet in length, allowing for lots of surf fishing spots for those who enjoy this particular style of fishing. Yellowtail and white sea bass have been caught at the end of the pier, although these are more of a rarity than other species found in the waters. Shallower water can be found in the middle section of the pier, providing the chance to catch species such as surf perch, halibut, corbina, and various sharks as well. Other top Southern California saltwater fishing locations include: San Diego Bay, Newport Beach, Oceanside, Catalina Island and Dana Point.